While summer and winter tires may look similar, they're vastly different in design. For one, they're made out of a more flexible rubber. The material can conform to icy roads to provide more traction. 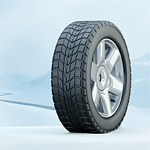 Winter tires also have weather-specific treads that are designed to reduce wheel slip. Despite the fact that winter tires are engineered with traction in mind, they can actually diminish your performance during the warmer months. The already flexible material get softer when they're used on hot pavement. As a result, they wear down faster and are at higher risk for damage. Not only is this dangerous for you, but it could also lead to more costly repairs down the line.